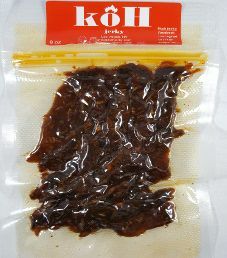 The first review for koH Jerky will focus on a 4 ounce/113 gram bag of their spicy flavored beef jerky. This jerky is described as being a bold tasting Vietnamese flavor with a secondary level of spiciness. The jerky was kindly submitted for review by the owner, Phuc Huynh (Fook Win). 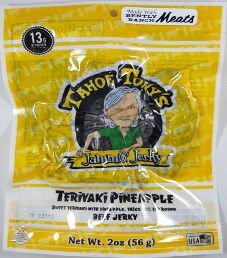 The next review for Tahoe Tony’s Jammin’ Jerky will be on a 2 ounce/56 gram bag of their teriyaki pineapple flavored 100% grass-fed beef jerky. This flavor is described as being sweet with pineapples. thick cut, and using top round beef. The bag was graciously submitted for review by the owner and CFO Brooke Luckey, who is married to the founder Tony Pearl. 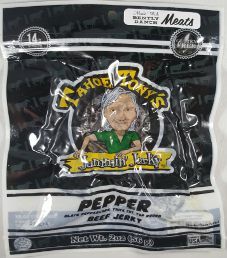 The next review for Tahoe Tony’s Jammin’ Jerky will be on a 2 ounce/56 gram bag of their pepper flavored 100% grass-fed beef jerky. 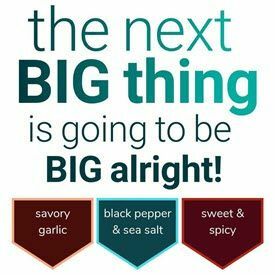 This flavor is advertised as a smoky cracked black pepper flavor with a “zing” that is also gluten, salt, and sugar free. The bag was kindly submitted for review by the owner and CFO Brooke Luckey, who is married to the founder Tony Pearl. 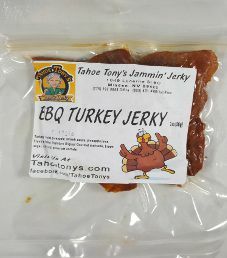 The next review for Tahoe Tony’s Jammin’ Jerky will be on a 2 ounce/56 gram bag of their BBQ flavored turkey jerky. This bag was kindly submitted for review by the owner and CFO Brooke Luckey, who is married to the founder Tony Pearl. 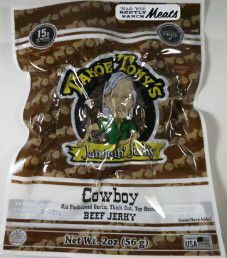 The next review for Tahoe Tony’s Jammin’ Jerky will be on a 2 ounce/56 gram bag of their cowboy flavored 100% grass-fed beef jerky. This flavor is advertised as old fashioned garlic, being sugar, salt, and gluten free. The bag was graciously submitted for review by the owner and CFO Brooke Luckey, who is married to the founder Tony Pearl.